The games began more than one month ago. Members of the general student body began trickling onto campuses across the NEC soon after. The summer essentially ended a few weeks ago, but, now, it’s official. The Autumn Equinox is here. It’s time to write the obituary for Summer 2016. Since we’re somewhat Twitter-obsessed here at the Overtime! 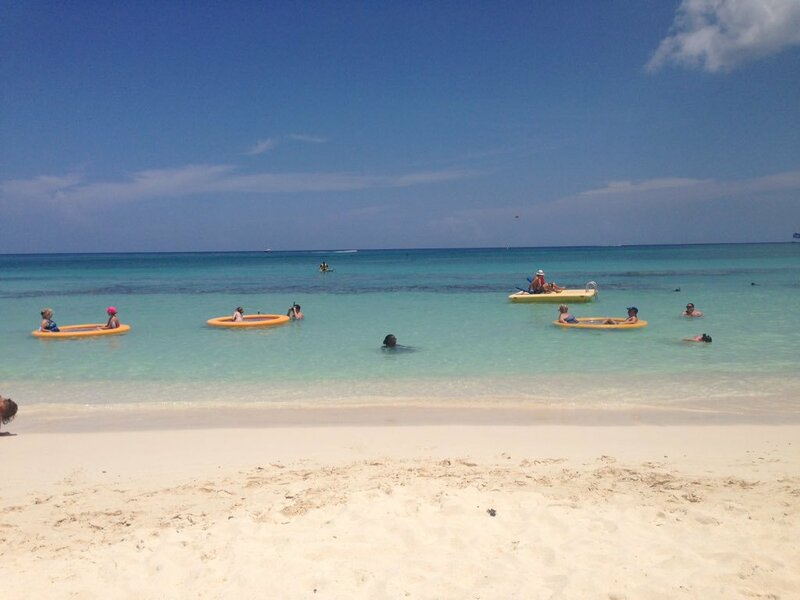 Blog, we are going to use tweets to tell the story of the summer. After all, if it wasn’t tweeted about, did it really even happen? There is one little twist to our Summer In Review Tweet Sheet. We used tweets from NEC coaches only. After all, coaches like summertime, too, right? The U.S. News & World Report revealed its 2017 Best Colleges rankings and the Northeast Conference has plenty of representation. 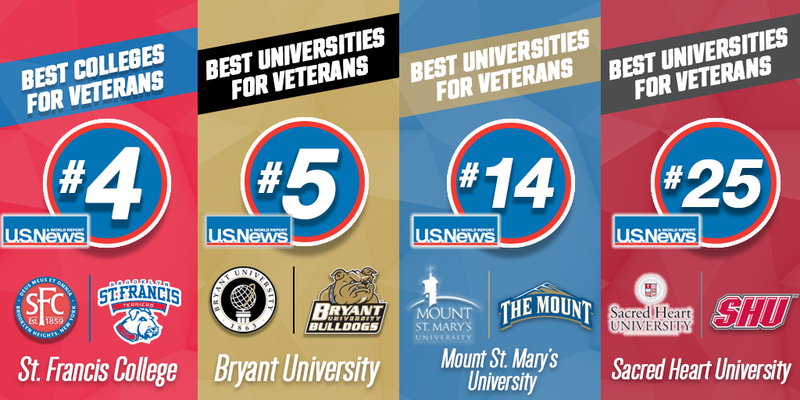 A total of eight NEC schools appeared on top-100 lists for best regional colleges/universities, while Robert Morris made its first appearance on the U.S. News and World Report rankings of national universities, debuting at No. 188. Their offense features the third-leading passer in NEC history, but the Dukes’ latest performance proves they’re much more than one-dimensional. One week after scoring three touchdowns in a convincing win over Patriot League member Bucknell, freshman AJ Hines erupted for 189 yards rushing and two scores in a win over regional rival Dayton. The rookie running back accounted for the highest single-game rushing output by a DU freshman since Larry McCoy (the program’s all-time rushing leader) logged 195 yards at Nicholls State on Sept. 12, 2009. As a result, Hines, who scored on touchdown runs of 10 and 37 yards, snared the STATS Inc FCS Freshman Player of the Week award. STATS, which also issues weekly awards on offense, defense and special teams, lauded two more NEC players with a Week 3 Honorable Mention. 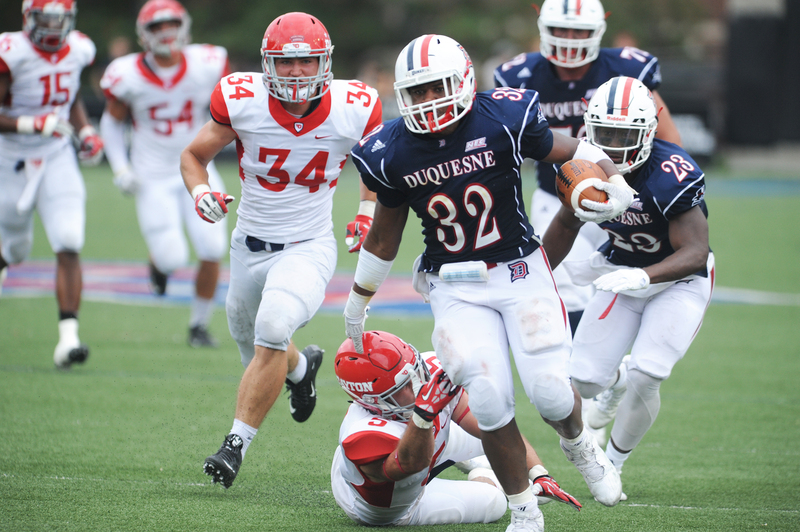 Duquesne’s Christian Kuntz was a top candidate for the Defensive Player of the Week honor after leading Duquesne’s dominant effort with 6.0 tackles for loss. Saint Francis’ Marcus Bagley, who ran for a Division I FCS single-game season high 220 yards at Columbia, was one of seven offensive players to receive an Honorable Mention. Read more here. It was a good week for former Wagner Seahawks in the pros. With NFL teams trimming their rosters down to 53 players apiece, former Wagner linebacker Julian Stanford earned one of those coveted roster spots. Stanford, who enters his fifth season in the NFL following stints with Jacksonville, Detroit and Tampa Bay, signed a futures/reserve contract with the Jets this past winter. Dominique Williams, Stanford’s former teammate at Wagner, made the Jets’ preliminary 53-man roster, but was released one day later. 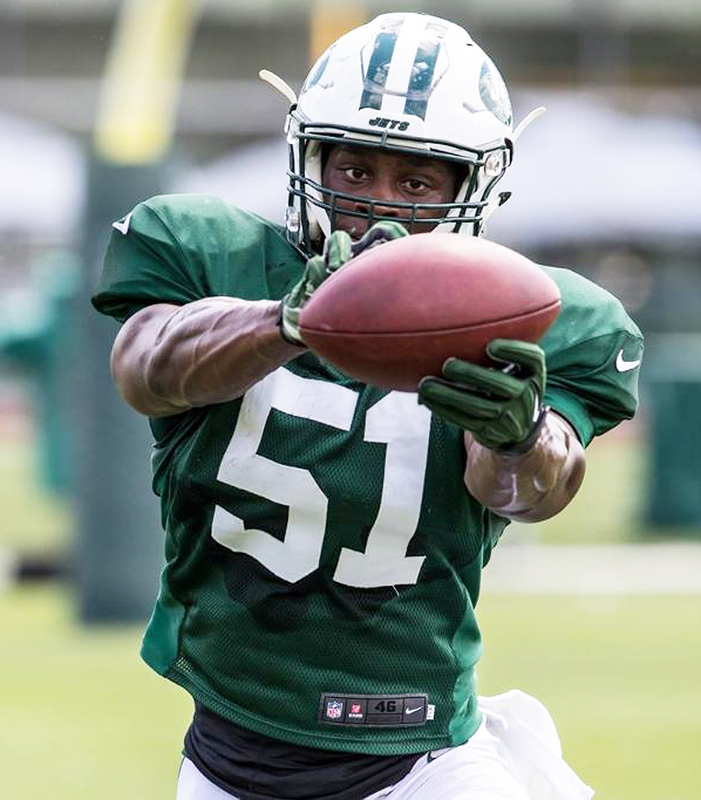 One of the NEC’s all-time leading rushers wasn’t out of work for long, however, as the Jets signed Williams to their practice squad later in the week. While Stanford and Williams were auditioning for Gang Green, another former Wagner Seahawk was battling for a return to the big leagues. Right-handed relief pitcher Andrew Bailey, a former two-time American League All-Star, hadn’t earned a save at the MLB level since 2013. After performing well for the Salt Lake Bees, the Angels’ AAA affiliate, Bailey earned a return ticket to the bigs and seems to have solidified the back end of Los Angeles’ bullpen. 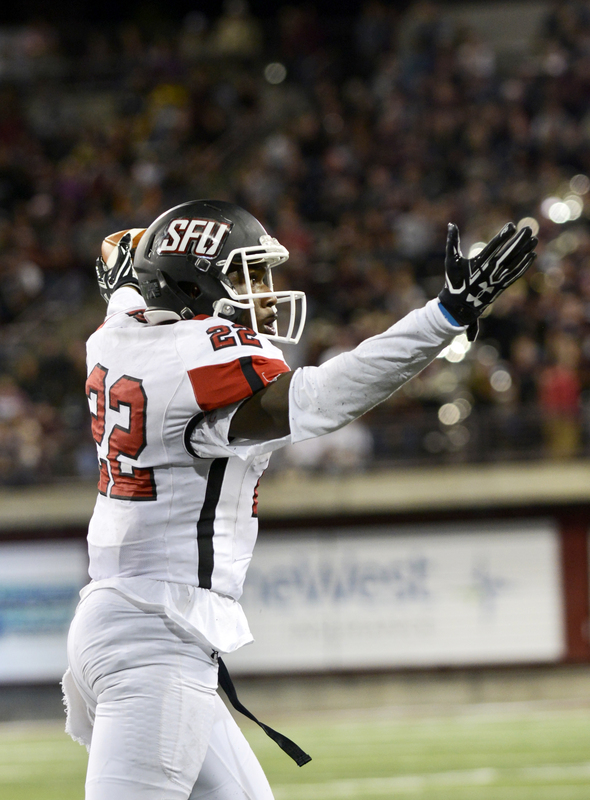 It was the biggest stage that Saint Francis had ever played on during its history as a Division I FCS program, but the moment wasn’t too big for the Red Flash’s All-American return man. Senior Lorenzo Jerome, who was the 2015 national leader in kickoff return average, torched No. 13 Montana for 237 all-purpose yards. He logged 196 yards and one touchdown on four kickoff returns during the 41-31 season-opening setback that was played before a crowd of 26,002 in Missoula. As a result, STATS Inc., the leader in FCS coverage, tabbed the SFU senior as its top special teamer of the week. Jerome returned a kickoff 79 yards for a touchdown midway through the fourth quarter and it wasn’t even his longest return in the Northeast Conference team’s 41-31 loss at FCS power Montana. In the third quarter, the second-team STATS FCS All-America kickoff returner had an 86-yard return to the Montana 7, which set up a Red Flash touchdown and gave his team a 17-13 lead in the third quarter. He finished with 196 yards on four kick returns and had another 41 yards on two punt returns. He also terrorized Montana on defense, collecting 10 tackles (five solo), one tackle for loss, two interceptions and one pass breakup – STATS Inc.
Don’t be satisfied with just competing. Have the crave to win every game, every rep and every second. Lorenzo Jerome is a legit. If you haven’t seen this kid play, NFL GMs, you’re missing out on a gem. Came into WaGriz and balled! @NECralph, BTW, Lorenzo Jerome is the real deal. Recorded the game. Watching now. Impressed. Big time.